I am an island girl and I love island life, so my trip to Belize wouldn’t be complete without a visit to the cayes. I had the best time and it was such a great way to end my trip in Belize. Read my travel tips for Ambergris Caye, including why you should go, what to do and where to stay. If I had to believe all that has been written about Ambergris Caye I might not have ended up there. It is portrayed as a touristic, overdeveloped place and it isn’t ‘la isla bonita’ as it used to be. I have to disagree. In my opinion, it was such a laid back place. It might be our timin, because June is the beginning of the rain season and thus less crowded in the Caribbean. In comparison to many of the other islands I have visited, this place feels like a little piece of paradise. I loved the simple way of life here. Because the island is long and thin you are always in contact with the ocean. I actually loved it so much I could see myself living here. So who knows what the future holds. The village of San Pedro has many colorful Caribbean houses and fun souvenir shops. 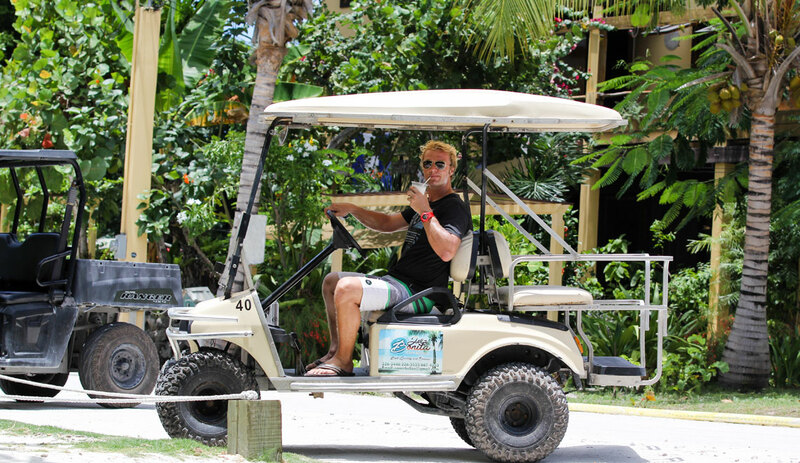 Transportation on the island is mostly by golf cart and a lot of fun! We got to know a few of the islanders in a matter of days. 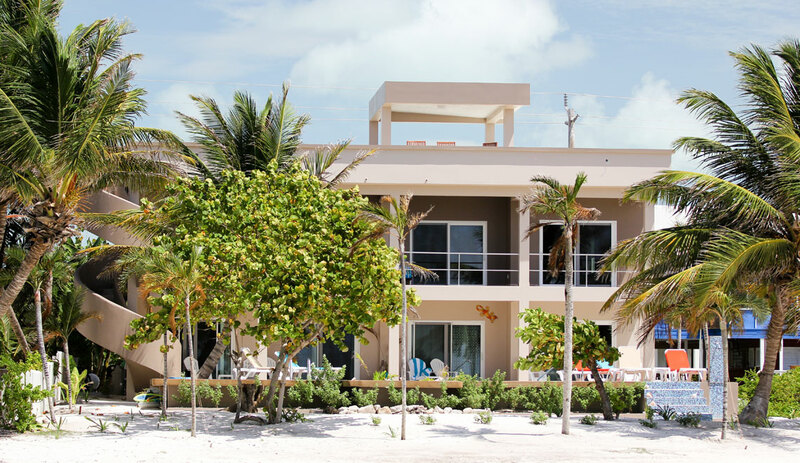 If you love to relax, Ambergris Caye is the perfect setting. There are many simple pleasures to enjoy. Sip up on a cocktail at the beach, or ride your bike along the beach path underneath the shade of the coconut trees. I recommend you to go and do as much as you can. If you like to do something more exciting you have to book this guided tour. This is hands down the best snorkeling trip I have ever done. And I consider myself an experienced snorkeler in the Caribbean.The magnificent coral formations attract a diversity of sea creatures. In a matter of minutes, I have seen nurse sharks, manta rays, sea turtles and lots of colorful fishes. In a rare case, you can even spot manatees feeding on the seagrass. I am impressed how well they preserve this marine park. Already satisfied with what I have seen, our tour guide set course a few miles further to take us to Shark Ray Alley. The name tells you exactly what to expect. A lot of sharks. Local fisherman used to clean their catch in this area and some still do. Once our boat arrives in this area the sharks think it is feeding time. I was just a bit scared when our tour guide told me not to jump on the sharks. I was asking myself how not to. They are everywhere. This is truly an unforgettable adventure. We kept hearing about this secret beach. It sounded intriguing. So we rented a golf cart and headed down to this well-hidden spot everybody was telling us about, tucked on the west side of the island. Many times along the road I thought we must have gotten a wrong turn. We couldn’t see a soul driving here. We just kept following the instruction and suddenly this tiny beach popped up. The beach, to be honest, isn’t the most beautiful beach on the island. The beach is popular if you like to go for a swim. That is because the other side of the island has very shallow water. Don’t forget to bring your mosquito repellent. There are many annoying mosquitos in the rain season. Please don’t be discouraged to go. The ride through the roughed land on your way to the beach is worth to see. Belize is the second largest barrier reef in the world. So needless to say you should explore the reef up close. 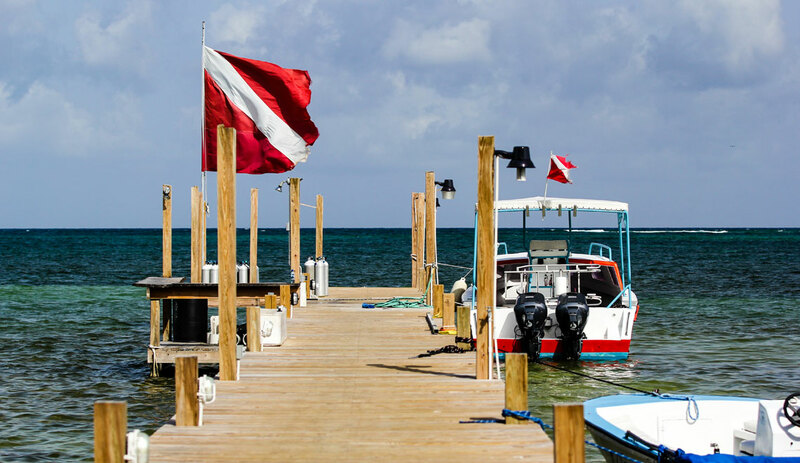 There are various ecosystems to be found in the waters of Ambergris Caye. Which makes the variety of species here wider than anywhere else in Belize. There are enough simple and still interesting spots to keep beginners enthralled. Sebastiaan isn’t a dive fanatic but always loves to see the underwater world of the places we visit. The boat dive with the guides of the Dive Bar took him to the end of the reef. Tres Cocos is on of the deepest sites with spur walls covered with red sponges and vase sponges. The diving here is so great because you will most likely encounter some of the larger sea creatures. 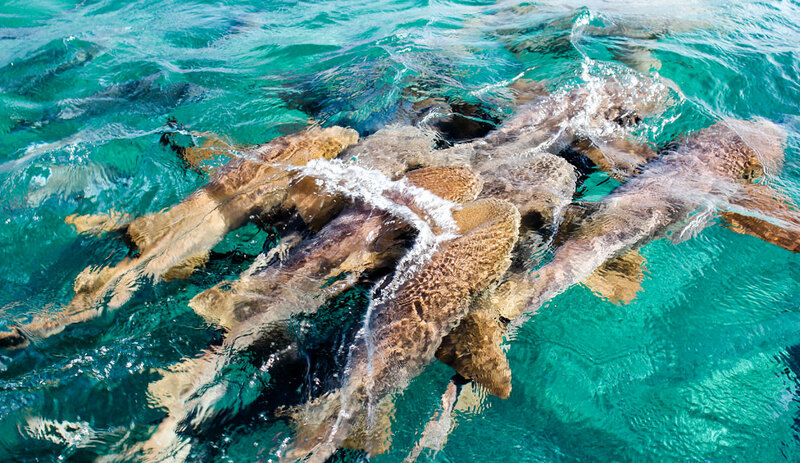 Sebastiaan bumped into a nurse shark that kept following him to get his or her picture taken. Don’t forget to get your camera ready! This was my first time driving a golf cart without being on a golf track.It was lots of fun. We were driving around the small streets of the village and just parked our cart anywhere, even the beach. It isn’t just a touristic thing, everybody on this island has one. The feeling of jumping on your cart and exploring the island is one of the best. You can hop on and off whenever you please. It’s the best way of transportation on this island. On one of the first days, we were still cart-less. For fun, we tried hitching a ride, and it worked! The people here are so nice. Now I would love to have one at home! Something I looked forward to do was just relaxing. We hiked through the jungles of Belize for weeks and I wanted to go back home feeling energized. Sebastiaan and I have lived in the Caribbean for several years and we love the saying: ‘It’s 5 ‘o clock somewhere’. The world is just a bit better with good food and a refreshing drink. Barhopping is a relaxed way of exploring the island. A great place to stop is the Truck Stop. A hip new concept consisting of 4 simple containers. At this lively place can eat different varieties of food and have a cocktail at the bar. Play a game of throwing horseshoes. Ladder golf and the bean bag toss games were getting harder after one more drink at one more bar. We booked an oceanfront suite with the owners, Mike and Laura. They recently opened their Twisted Palm Villas on the northeastern side of the island. All the luxury suites offer all you need for a relaxing vacation. Lovely decorated and Mike and Laura will go above and beyond to make you feel welcome. The best feeling in the world for me is to wake up seeing the beach and being able to walk up to the shoreline. The swimming pool on the beach is a big plus. And I made use of it a lot. Most of the beaches on Ambergris Caye aren’t the best swimming beaches because of the shallow water and the seagrass. The Dive Bar next door is nice to grab a biteor a cocktail and make use of their kayaks (free of charge for paying clients). This area isn’t as crowded as San Pedro and has lots of new exciting restaurants and bars. 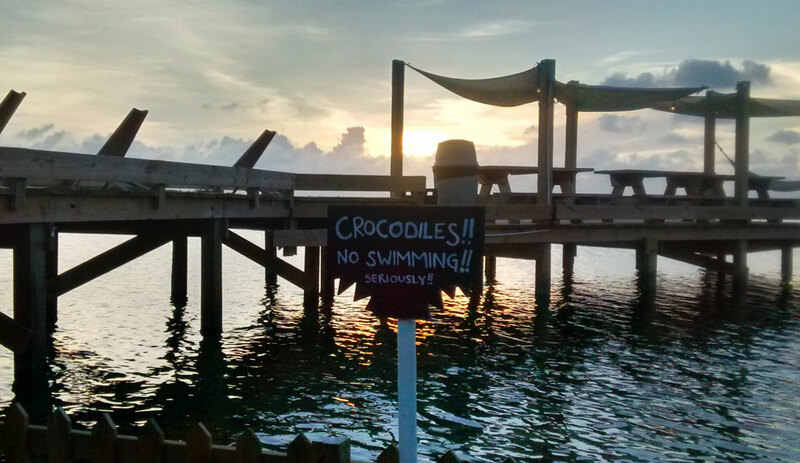 Ambergris Caye is definitely worth a visit. Try to go in the low season to avoid the crowds. We have been for 4 days in June, which was enough to get to know the island. It has been the perfect destination full of activities, watersports, sightseeing and relaxing. Have you been? Please share your experience in the comments below. Sounds great! Hope we will go there! ?